When I heard that Ta-Nehisi Coates was writing another book, I signed up to read it on NetGalley with lightning quickness. I also read his writings elsewhere such as The Atlantic, Twitter. Matter of fact, I’ll usually drop everything I’m doing to read Mr. Coates because his perspective and words on the most pressing issues of our time are impeccable. If you aren’t reading Ta-Nehisi Coates then you probably should be. 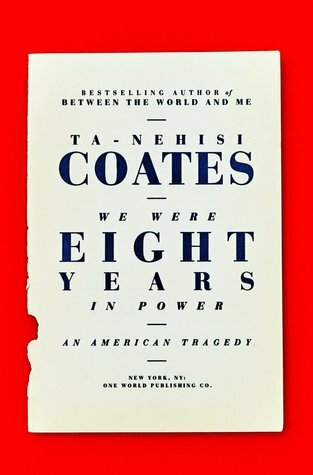 Like “Between the World and Me,” “We Were Eight Years in Power: An American Tragedy” is a searing testimony to the ongoing quagmire of race in the United States: to high hopes, to failed promises, to the uncertainty of what lies ahead. These are a collection of eight essays that appeared in The Atlantic (one for each of the eight years that President Obama was in office) with a short preface added by Coates before each, which give the reading more perspective and insight. Do read this. It should be required reading in all schools and universities.